After a long year, the body and mind do need a bit of a break, or change in focus. Top athletes are always looking for opportunity to improve. I like to refer to the months of November to January as the “shoulder season”, transitioning from race mode to recovery with skill acquisition, prior to starting early season base phase. The goal of the adult athlete is to improve, which means getting faster, stronger, smarter, and more skillful. Rather than continuing to push hard day in and day out, use this precious window of time to work on skills. With the three different disciplines in triathlon, there are plenty of areas to work on. As adults, the acquisition of a new skill is a huge boost to confidence. Here are some shoulder season focal points for you. Rather than trying to get faster, initially aim to be consistent in your swim times. Start with shorter distances like 50s and 100s, and then progress to longer distances like 200s and 400s. The shorter the distance, the closer the times should be. Keep all intervals within 3 to 5 percent. Additionally, most adult swimmers need to focus on two main technical areas: propulsion and body position. Improve either of these and you will go faster. Always include some drills in warmup that aim to develop a better catch. 25m of front scull with a high elbow followed by 25m of swimming with a long smooth stroke and strong pull is a good choice. This reinforces a high elbow catch and feel for the water. Commit two months to D.P.S. (Distance Per Stroke). 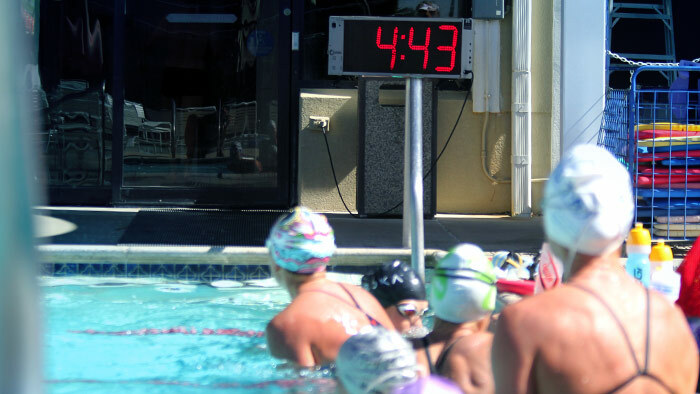 For different intervals, count your strokes while timing yourself for a portion of every swim. First, spend two weeks reducing your stroke count by pulling more water harder (not pausing between strokes). Second, spend six weeks maintaining that stroke count over gradually longer distances or reducing your time at that same distance and same stroke count. These are both gauges of increased stroke efficiency. Either way you are travelling further with every stroke. An indication of good body position is low head, shallow read-end, and your heels just breaking the surface of the water during your kick. Practice kicking without a board for 25m on your stomach, and on either side, rotated 45 to 60 degrees for the 25m. Focus on looking straight down at the bottom of the pool between breaths, instead of forward. When breathing, keep body roll efficient by only looking to the pool gutter rather than the ceiling or bleachers. Focus on one or two elements of body position per workout rather than everything at once. Improve your future performance by including trainer workouts that challenge different aspects of pedal stroke. For strength and power, focus on sets at 50 to 65rpm with high pedal force and low heart rate. This also slows your pedal stroke allowing you to focus on engaging the full circumference of the stroke, not just the downward push on the pedals. Think of pushing “up and over” the top of the stroke, or “scraping mud off the bottom of your shoe” through the top and bottom of your pedal stroke. As an added challenge, increase to 90rpm at high effort for the final minute to simulate cresting the top of a hill. To encourage smooth and proficient pedaling, and efficiency maintaining pressure on the pedals for tailwind or downhills, aim for 120 to 140rpm. Begin with short intervals of 15 seconds and increase by that amount until you reach two or three minutes. The goal is to do this workout without bouncing on the saddle. Last, do single-leg drills to improve individual leg pedaling efficiency. Ride at 70 to 90rpm with one leg clipped in, the other unclipped against you seat stay. Start with 15 seconds and work your way up to two minutes. If you are finding this daunting or difficult, envision the para-triathletes riding an entire Ironman course with one leg. One common skill that many athletes need to work on is posture. The goal is to have a straight line pass through the head, shoulders, hips and ankles, with a slight lean forward. A common mistake is letting your hips drop as you fatigue, resulting in running in an upright seated position. The cause can be as simple as a weak core or a lack of awareness. During base runs and on the hills consciously think about keeping the hips forward and over top of the foot strike as you run. Run with your head high and proud, and your eyes scanning the ground about 30m in front of you. Finding a 200 to 400m stretch with a slight downhill grade of one percent is a great place to work on posture. Lean slightly forward from the hips and chest, and run at 10k race pace for short stretches. Run cadence is an important factor in run economy as well. I have coached seasoned runners to personal bests by simply refining their stride rate. They find they have better second halves in their run races as they are not fatigued from over-striding during the first half. Quantify cadence for all runs and all paces. Keep cadence higher that 90 strides per minute (counting one leg only). Count one single leg for 30 seconds with a goal of 45 or more foot strikes regularly through your runs, or better yet, invest in a watch (Timex, Polar, Garmin, etc.) that has cadence measuring technology. This is a short list of small changes that can be made easily when there is no pressure to perform. Use the shoulder season to work on a skill or technique before training begins in earnest.